Last March I celebrated my 47th birthday, a milestone as my wife would call it, a period of self-reflection in my opinion. As I look in the mirror, I noticed the strands of grey starting to sprinkle around my once completely black hair. The laugh lines that used to disappear after a good chuckle now remain. Skin that used to feel as smooth as a fresh shiny apple now resembles more of a raisin. Ah yes, gotta love the aging process, I guess we all have to face it one time or another. Although, I eat extremely healthy and workout 6 days a week training in a martial art called Brazilian Jiu-jitsu, Father-Time sends me daily reminders that the years are starting to quickly pass by. Where I once quickly hopped out of bed in the morning is now replaced with groan from a few aches and muscle tightness after a good workout the day before. To me I find it hard to believe, it seemed not so long ago I was that young 16-year-old athlete admiring the great athletes of my generation, Joe Montana, Wayne Gretzky, and Michael Jordan. They played their respective sports to the highest level, making every move seem easy and effortless. Now I see pictures of them and they look so…like me…middle aged! Gone are the youthful baby faced looks, replaced with much older mature facial features. Like me they share their battle scars sharing their aches and pains from their years of physically abusing their bodies night after night. There are times I wish I can take a magic pill to bring my body back to my youth, but with all things considered I have to say I’ve done pretty good when it comes to maintaining my health as I got older. It is this quest to maintain my youthfulness that has wet my appetite over the years to seek knowledge on maintaining peak performance for older active individuals. One of these areas of interest was increasing and maintaining flexibility as I got older. As we age we begin to lose our flexibility and our fascial tissue becomes drier. Compounding this stiffness is sitting for long hours at work, driving, or surfing in front of the computer. As a result, we not only see a reduction in athletic performance, but potential to injure ourselves during exercise. About six months ago, one of my fellow teammates, who is 42 years old, snapped his hamstring during practice causing him horrific pain resulting in surgery and many months of intense rehab. I asked him what caused the injury, his doctor said it was due to the lack of stretching and flexibility. Therefore, when he worked out, the stress on his tight hamstring finally gave out. A number of years ago, I was sidelined with bulging disks in my lower back forcing my wife to dress me for two months as I hobbled around like an 85-year-old man. I attributed this injury to my laisse faire attitude towards stretching. I never forgot the pain and since then I make a conscious effort to implement prehab instead of rehab into my daily exercise routine consisting of stretching and manual therapy. One of the best modalities I found helpful was stretch therapy and osteopathy. Osteopathy is holistic manual medicine used to treat the body as a whole unit. It’s useful in treating back pain, sciatica, sports injuries, and postural strain. It is a gentle form of treatments consisting of gentle stretches to release connective tissues, strengthening unstable joints through muscle conditioning, and educating patients about diet, exercise, and lifestyle changes. Many report an overall sense of well-being, increased mobility, decrease in muscle stiffness and pain after a few sessions. For active individuals, this helps significantly improve their performance, runners run faster due to increased stride length, cyclists pedal faster due to improved hip mobility, and cross fitters break personal records as a result of better range of motion. Looking to improving your performance and warding off the ravages of time? Give stretch therapy and osteopathy a try! You won’t be disappointed. 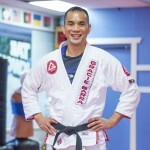 Raz is a lifelong athlete, began studying martial arts at the age of 5 under his father master James Chan. He holds a black belt in Brazilian Jiu-jitsu, and is also a 2x World Brazilian Jiu-Jitsu Masters silver medalist and 2x US Open Champion. He enjoys helping active individuals perform at their peak by improving their flexibility, mobility and overall well-being. His client list range from Hollywood celebrities, movie directors, executives, and athletes from young to old.